I could live anywhere in the world, and I choose Chicago. Not just because it's my home town, and not just because I've worked in this city all my life. I choose Chicago because it's an exciting place. 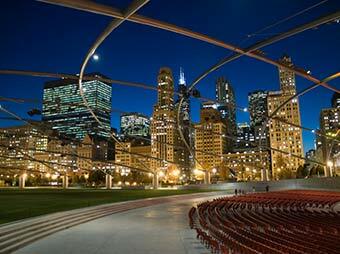 Visit Lino's Hotspots for a personal guide to the excitement Chicago has to offer. Click Useful Links for other helpful resources to the city. We have glorious museums, starting with the world-famous Art Institute. Then there's the Adler Planetarium, the Shedd Aquarium, the Chicago Academy of Science, The Children's Museum and The Chicago History Museum. We've got Sue the tyrannosaurus at the Field Museum and the Nations at Christmas exhibit at the Museum of Science and Industry, to name just two favorites. There's a museum for almost every ethnicity - Polish, Mexican, African-American, Ukrainian, Irish, Latvian, Lithuanian, Greek, and more. Want world-class theatre and music? It's here in spades. The Goodman, Steppenwolf, Royal George, Shubert, Reskin, Arie Crown, Ford Center, and Apollo. Shakespeare at Navy Pier. Opera at the Lyric. Symphony at Orchestra Hall. Not to mention dozens of blues and jazz clubs. Shopping doesn't get any better than the elegant stores on Michigan Avenue and Oak Street. Look for hustle and bustle on State Street and night life up and down Lincoln Avenue. Any food you could possibly imagine is here, from fine dining to down-home cooking and from ethnic cuisine to great American fare. Chicago is a sports fan's paradise. Cubs, White Sox, Bears, Bulls, Fire, The Blackhawks. A myriad of sports clubs and countless places to play a pick-up game of basketball with a bunch of buddies. World Class marathons & triathlons abound. The city's flat terrain & endless miles of lakefront & city designated bike paths make Chicago a biker's paradise. Looking for scenery and lovely views? Get on Lake Shore Drive and take in captivating Lake Michigan on one side and stately homes and apartment buildings on the other. Look at the beautifully maintained parkways bursting with flowers. Gaze at Chicago's renowned skyline.